"Banker" redirects here. For other uses, see Bank (disambiguation) and Banker (disambiguation). The Bank of England, established in 1694. A bank is a financial institution that accepts deposits from the public and creates credit. Lending activities can be performed either directly or indirectly through capital markets. Due to their importance in the financial stability of a country, banks are highly regulated in most countries. Most nations have institutionalized a system known as fractional reserve banking under which banks hold liquid assets equal to only a portion of their current liabilities. In addition to other regulations intended to ensure liquidity, banks are generally subject to minimum capital requirements based on an international set of capital standards, known as the Basel Accords. Banking in its modern sense evolved in the 14th century in the prosperous cities of Renaissance Italy but in many ways was a continuation of ideas and concepts of credit and lending that had their roots in the ancient world. In the history of banking, a number of banking dynasties – notably, the Medicis, the Fuggers, the Welsers, the Berenbergs, and the Rothschilds – have played a central role over many centuries. The oldest existing retail bank is Banca Monte dei Paschi di Siena, while the oldest existing merchant bank is Berenberg Bank. Among many other things, the Code of Hammurabi from 1754 BC recorded interest-bearing loans. The concept of banking may have begun in ancient Assyria and Babylonia, with merchants offering loans of grain as collateral within a barter system. Lenders in ancient Greece and during the Roman Empire added two important innovations: they accepted deposits and changed money. Archaeology from this period in ancient China and India also shows evidence of money lending. More modern banking can be traced to medieval and early Renaissance Italy, to the rich cities in the centre and north like Florence, Lucca, Siena, Venice and Genoa. The Bardi and Peruzzi families dominated banking in 14th-century Florence, establishing branches in many other parts of Europe. One of the most famous Italian banks was the Medici Bank, set up by Giovanni di Bicci de' Medici in 1397. The earliest known state deposit bank, Banco di San Giorgio (Bank of St. George), was founded in 1407 at Genoa, Italy. Modern banking practices, including fractional reserve banking and the issue of banknotes, emerged in the 17th and 18th centuries. Merchants started to store their gold with the goldsmiths of London, who possessed private vaults, and charged a fee for that service. In exchange for each deposit of precious metal, the goldsmiths issued receipts certifying the quantity and purity of the metal they held as a bailee; these receipts could not be assigned, only the original depositor could collect the stored goods. Sealing of the Bank of England Charter (1694), by Lady Jane Lindsay, 1905. Gradually the goldsmiths began to lend the money out on behalf of the depositor, which led to the development of modern banking practices; promissory notes (which evolved into banknotes) were issued for money deposited as a loan to the goldsmith. The goldsmith paid interest on these deposits. Since the promissory notes were payable on demand, and the advances (loans) to the goldsmith's customers were repayable over a longer time period, this was an early form of fractional reserve banking. The promissory notes developed into an assignable instrument which could circulate as a safe and convenient form of money backed by the goldsmith's promise to pay, allowing goldsmiths to advance loans with little risk of default. Thus, the goldsmiths of London became the forerunners of banking by creating new money based on credit. The Bank of England was the first to begin the permanent issue of banknotes, in 1695. The Royal Bank of Scotland established the first overdraft facility in 1728. By the beginning of the 19th century a bankers' clearing house was established in London to allow multiple banks to clear transactions. The Rothschilds pioneered international finance on a large scale, financing the purchase of the Suez canal for the British government. The word bank was taken Middle English from Middle French banque, from Old Italian banco, meaning "table", from Old High German banc, bank "bench, counter". Benches were used as makeshift desks or exchange counters during the Renaissance by Jewish Florentine bankers, who used to make their transactions atop desks covered by green tablecloths. Under English common law, a banker is defined as a person who carries on the business of banking by conducting current accounts for his customers, paying cheques drawn on him/her and collecting cheques for his/her customers. Banco de Venezuela in Coro. Branch of Nepal Bank in Pokhara, Western Nepal. In most common law jurisdictions there is a Bills of Exchange Act that codifies the law in relation to negotiable instruments, including cheques, and this Act contains a statutory definition of the term banker: banker includes a body of persons, whether incorporated or not, who carry on the business of banking' (Section 2, Interpretation). Although this definition seems circular, it is actually functional, because it ensures that the legal basis for bank transactions such as cheques does not depend on how the bank is structured or regulated. Since the advent of EFTPOS (Electronic Funds Transfer at Point Of Sale), direct credit, direct debit and internet banking, the cheque has lost its primacy in most banking systems as a payment instrument. This has led legal theorists to suggest that the cheque based definition should be broadened to include financial institutions that conduct current accounts for customers and enable customers to pay and be paid by third parties, even if they do not pay and collect cheques . Large door to an old bank vault. Banks act as payment agents by conducting checking or current accounts for customers, paying cheques drawn by customers in the bank, and collecting cheques deposited to customers' current accounts. Banks also enable customer payments via other payment methods such as Automated Clearing House (ACH), Wire transfers or telegraphic transfer, EFTPOS, and automated teller machines (ATMs). Banks borrow money by accepting funds deposited on current accounts, by accepting term deposits, and by issuing debt securities such as banknotes and bonds. Banks lend money by making advances to customers on current accounts, by making installment loans, and by investing in marketable debt securities and other forms of money lending. Activities undertaken by banks include personal banking, corporate banking, investment banking, private banking, transaction banking, insurance, consumer finance, foreign exchange trading, commodity trading, trading in equities, futures and options trading and money market trading. This difference is referred to as the spread between the cost of funds and the loan interest rate. Historically, profitability from lending activities has been cyclical and dependent on the needs and strengths of loan customers and the stage of the economic cycle. Fees and financial advice constitute a more stable revenue stream and banks have therefore placed more emphasis on these revenue lines to smooth their financial performance. First, this includes the Gramm–Leach–Bliley Act, which allows banks again to merge with investment and insurance houses. Merging banking, investment, and insurance functions allows traditional banks to respond to increasing consumer demands for "one-stop shopping" by enabling cross-selling of products (which, the banks hope, will also increase profitability). Second, they have expanded the use of risk-based pricing from business lending to consumer lending, which means charging higher interest rates to those customers that are considered to be a higher credit risk and thus increased chance of default on loans. This helps to offset the losses from bad loans, lowers the price of loans to those who have better credit histories, and offers credit products to high risk customers who would otherwise be denied credit. Third, they have sought to increase the methods of payment processing available to the general public and business clients. These products include debit cards, prepaid cards, smart cards, and credit cards. They make it easier for consumers to conveniently make transactions and smooth their consumption over time (in some countries with underdeveloped financial systems, it is still common to deal strictly in cash, including carrying suitcases filled with cash to purchase a home). However, with the convenience of easy credit, there is also increased risk that consumers will mismanage their financial resources and accumulate excessive debt. Banks make money from card products through interest charges and fees charged to cardholders, and transaction fees to retailers who accept the bank's credit and/or debit cards for payments. Recently, as banks have been faced with pressure from fintechs, new and additional business models have been suggested such as freemium, monetization of data, white-labelling of banking and payment applications, or the cross-selling of complementory products. A former building society, now a modern retail bank in Leeds, West Yorkshire. Banks face a number of risks in order to conduct their business, and how well these risks are managed and understood is a key driver behind profitability, and how much capital a bank is required to hold. Bank capital consists principally of equity, retained earnings and subordinated debt. Credit risk: risk of loss arising from a borrower who does not make payments as promised. Liquidity risk: risk that a given security or asset cannot be traded quickly enough in the market to prevent a loss (or make the required profit). Market risk: risk that the value of a portfolio, either an investment portfolio or a trading portfolio, will decrease due to the change in value of the market risk factors. Operational risk: risk arising from execution of a company's business functions. Reputational risk: a type of risk related to the trustworthiness of business. Macroeconomic risk: risks related to the aggregate economy the bank is operating in. The capital requirement is a bank regulation, which sets a framework within which a bank or depository institution must manage its balance sheet. The categorization of assets and capital is highly standardized so that it can be risk weighted. Asset liability mismatch/Maturity transformation – banks borrow more on demand debt and short term debt, but provide more long term loans. In other words, they borrow short and lend long. With a stronger credit quality than most other borrowers, banks can do this by aggregating issues (e.g. accepting deposits and issuing banknotes) and redemptions (e.g. withdrawals and redemption of banknotes), maintaining reserves of cash, investing in marketable securities that can be readily converted to cash if needed, and raising replacement funding as needed from various sources (e.g. wholesale cash markets and securities markets). Money creation/destruction – whenever a bank gives out a loan in a fractional-reserve banking system, a new sum of money is created and conversely, whenever the principal on that loan is repaid money is destroyed. Banks are susceptible to many forms of risk which have triggered occasional systemic crises. These include liquidity risk (where many depositors may request withdrawals in excess of available funds), credit risk (the chance that those who owe money to the bank will not repay it), and interest rate risk (the possibility that the bank will become unprofitable, if rising interest rates force it to pay relatively more on its deposits than it receives on its loans). Banking crises have developed many times throughout history when one or more risks have emerged for a banking sector as a whole. Prominent examples include the bank run that occurred during the Great Depression, the U.S. Savings and Loan crisis in the 1980s and early 1990s, the Japanese banking crisis during the 1990s, and the sub-prime mortgage crisis in the 2000s. The United States has the most banks in the world in terms of institutions (5,330 as of 2015) and possibly branches (81,607 as of 2015). This is an indicator of the geography and regulatory structure of the US, resulting in a large number of small to medium-sized institutions in its banking system. As of November 2009, China's top 4 banks have in excess of 67,000 branches (ICBC:18000+, BOC:12000+, CCB:13000+, ABC:24000+) with an additional 140 smaller banks with an undetermined number of branches. Japan had 129 banks and 12,000 branches. In 2004, Germany, France, and Italy each had more than 30,000 branches – more than double the 15,000 branches in the UK. Currently, commercial banks are regulated in most jurisdictions by government entities and require a special bank license to operate. Unlike most other regulated industries, the regulator is typically also a participant in the market, being either a publicly or privately governed central bank. Central banks also typically have a monopoly on the business of issuing banknotes. However, in some countries this is not the case. In the UK, for example, the Financial Services Authority licenses banks, and some commercial banks (such as the Bank of Scotland) issue their own banknotes in addition to those issued by the Bank of England, the UK government's central bank. Banking law is based on a contractual analysis of the relationship between the bank (defined above) and the customer – defined as any entity for which the bank agrees to conduct an account. Some types of financial institution, such as building societies and credit unions, may be partly or wholly exempt from bank license requirements, and therefore regulated under separate rules. investment banking, relating to activities on the financial markets. Most banks are profit-making, private enterprises. However, some are owned by government, or are non-profit organizations. Commercial banks: the term used for a normal bank to distinguish it from an investment bank. After the Great Depression, the U.S. Congress required that banks only engage in banking activities, whereas investment banks were limited to capital market activities. Since the two no longer have to be under separate ownership, some use the term "commercial bank" to refer to a bank or a division of a bank that mostly deals with deposits and loans from corporations or large businesses. Community banks: locally operated financial institutions that empower employees to make local decisions to serve their customers and the partners. Community development banks: regulated banks that provide financial services and credit to under-served markets or populations. Land development banks: The special banks providing long-term loans are called land development banks (LDB). The history of LDB is quite old. The first LDB was started at Jhang in Punjab in 1920. The main objective of the LDBs are to promote the development of land, agriculture and increase the agricultural production. The LDBs provide long-term finance to members directly through their branches. Credit unions or co-operative banks: not-for-profit cooperatives owned by the depositors and often offering rates more favourable than for-profit banks. Typically, membership is restricted to employees of a particular company, residents of a defined area, members of a certain union or religious organizations, and their immediate families. Postal savings banks: savings banks associated with national postal systems. Offshore banks: banks located in jurisdictions with low taxation and regulation. Many offshore banks are essentially private banks. Savings bank: in Europe, savings banks took their roots in the 19th or sometimes even in the 18th century. Their original objective was to provide easily accessible savings products to all strata of the population. In some countries, savings banks were created on public initiative; in others, socially committed individuals created foundations to put in place the necessary infrastructure. Nowadays, European savings banks have kept their focus on retail banking: payments, savings products, credits and insurances for individuals or small and medium-sized enterprises. Apart from this retail focus, they also differ from commercial banks by their broadly decentralized distribution network, providing local and regional outreach – and by their socially responsible approach to business and society. Building societies and Landesbanks: institutions that conduct retail banking. Ethical banks: banks that prioritize the transparency of all operations and make only what they consider to be socially responsible investments. Structure of the organised banking sector in India. Numbers of banks are in brackets. Investment banks "underwrite" (guarantee the sale of) stock and bond issues, trade for their own accounts, make markets, provide investment management, and advise corporations on capital market activities such as mergers and acquisitions. Merchant banks were traditionally banks which engaged in trade finance. The modern definition, however, refers to banks which provide capital to firms in the form of shares rather than loans. Unlike venture caps, they tend not to invest in new companies. Universal banks, more commonly known as financial services companies, engage in several of these activities. These big banks are very diversified groups that, among other services, also distribute insurance – hence the term bancassurance, a portmanteau word combining "banque or bank" and "assurance", signifying that both banking and insurance are provided by the same corporate entity. Central banks are normally government-owned and charged with quasi-regulatory responsibilities, such as supervising commercial banks, or controlling the cash interest rate. They generally provide liquidity to the banking system and act as the lender of last resort in event of a crisis. Islamic banks adhere to the concepts of Islamic law. This form of banking revolves around several well-established principles based on Islamic canons. All banking activities must avoid interest, a concept that is forbidden in Islam. Instead, the bank earns profit (markup) and fees on the financing facilities that it extends to customers. The United States banking industry is one of the most heavily regulated and guarded in the world, with multiple specialized and focused regulators. All banks with FDIC-insured deposits have the Federal Deposit Insurance Corporation (FDIC) as a regulator. However, for soundness examinations (i.e., whether a bank is operating in a sound manner), the Federal Reserve is the primary federal regulator for Fed-member state banks; the Office of the Comptroller of the Currency (OCC) is the primary federal regulator for national banks. State non-member banks are examined by the state agencies as well as the FDIC. National banks have one primary regulator – the OCC. Each regulatory agency has their own set of rules and regulations to which banks and thrifts must adhere. The Federal Financial Institutions Examination Council (FFIEC) was established in 1979 as a formal inter-agency body empowered to prescribe uniform principles, standards, and report forms for the federal examination of financial institutions. Although the FFIEC has resulted in a greater degree of regulatory consistency between the agencies, the rules and regulations are constantly changing. The management of the banks’ asset portfolios also remains a challenge in today's economic environment. Loans are a bank's primary asset category and when loan quality becomes suspect, the foundation of a bank is shaken to the core. While always an issue for banks, declining asset quality has become a big problem for financial institutions. As a reaction, banks have developed their activities in financial instruments, through financial market operations such as brokerage and have become big players in such activities. To be able to provide home buyers and builders with the funds needed, banks must compete for deposits. The phenomenon of disintermediation had to dollars moving from savings accounts and into direct market instruments such as U.S. Department of Treasury obligations, agency securities, and corporate debt. One of the greatest factors in recent years in the movement of deposits was the tremendous growth of money market funds whose higher interest rates attracted consumer deposits. Passbook or ordinary deposit accounts – permit any amount to be added to or withdrawn from the account at any time. Money market accounts – carry a monthly limit of preauthorized transfers to other accounts or persons and may require a minimum or average balance. Individual retirement accounts (IRAs) and Keogh plans – a form of retirement savings in which the funds deposited and interest earned are exempt from income tax until after withdrawal. Checking accounts – offered by some institutions under definite restrictions. Club accounts and other savings accounts – designed to help people save regularly to meet certain goals. Bank statements are accounting records produced by banks under the various accounting standards of the world. Under GAAP there are two kinds of accounts: debit and credit. Credit accounts are Revenue, Equity and Liabilities. Debit Accounts are Assets and Expenses. The bank credits a credit account to increase its balance, and debits a credit account to decrease its balance. One source of deposits for banks is brokers who deposit large sums of money on behalf of investors through trust corporations. This money will generally go to the banks which offer the most favourable terms, often better than those offered local depositors. It is possible for a bank to engage in business with no local deposits at all, all funds being brokered deposits. Accepting a significant quantity of such deposits, or "hot money" as it is sometimes called, puts a bank in a difficult and sometimes risky position, as the funds must be lent or invested in a way that yields a return sufficient to pay the high interest being paid on the brokered deposits. This may result in risky decisions and even in eventual failure of the bank. Banks which failed during 2008 and 2009 in the United States during the global financial crisis had, on average, four times more brokered deposits as a percent of their deposits than the average bank. Such deposits, combined with risky real estate investments, factored into the savings and loan crisis of the 1980s. Regulation of brokered deposits is opposed by banks on the grounds that the practice can be a source of external funding to growing communities with insufficient local deposits. There are different types of accounts: saving, recurring and current accounts. In modern time there has been huge reductions to the barriers of global competition in the banking industry. Increases in telecommunications and other financial technologies, such as Bloomberg, have allowed banks to extend their reach all over the world, since they no longer have to be near customers to manage both their finances and their risk. The growth in cross-border activities has also increased the demand for banks that can provide various services across borders to different nationalities. However, despite these reductions in barriers and growth in cross-border activities, the banking industry is nowhere near as globalized as some other industries. In the US, for instance, very few banks even worry about the Riegle–Neal Act, which promotes more efficient interstate banking. In the vast majority of nations around the globe the market share for foreign owned banks is currently less than a tenth of all market shares for banks in a particular nation. One reason the banking industry has not been fully globalized is that it is more convenient to have local banks provide loans to small business and individuals. On the other hand, for large corporations, it is not as important in what nation the bank is in, since the corporation's financial information is available around the globe. 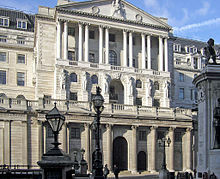 ^ "Bank of England". Rulebook Glossary. 1 January 2014. Retrieved 13 July 2018. ^ Hoggson, N. F. (1926) Banking Through the Ages, New York, Dodd, Mead & Company. ^ Macesich, George (30 June 2000). "Central Banking: The Early Years: Other Early Banks". Issues in Money and Banking. Westport, Connecticut: Praeger Publishers (Greenwood Publishing Group). p. 42. doi:10.1336/0275967778. ISBN 978-0-275-96777-2. Retrieved 2009-03-12. The first state deposit bank was the Bank of St. George in Genoa, which was established in 1407. ^ Thus by the 19th century we find “[i]n ordinary cases of deposits of money with banking corporations, or bankers, the transaction amounts to a mere loan or mutuum, and the bank is to restore, not the same money, but an equivalent sum, whenever it is demanded.” Joseph Story, Commentaries on the Law of Bailments (1832, p. 66) and “Money, when paid into a bank, ceases altogether to be the money of the principal (see Parker v. Marchant, 1 Phillips 360); it is then the money of the banker, who is bound to return an equivalent by paying a similar sum to that deposited with him when he is asked for it.” Lord Chancellor Cottenham, Foley v Hill (1848) 2 HLC 28. ^ "A History of British Banknotes". britishnotes.co.uk. ^ "A short history of overdrafts". eccount money. Archived from the original on 2013-11-05. ^ Morton, Julius Sterling (1898). The Conservative. p. 346. ^ de Albuquerque, Martim (1855). Notes and Queries. London: George Bell. p. 431. ^ (Banking Ordinance, Section 2, Interpretation, Hong Kong) Note that in this case the definition is extended to include accepting any deposits repayable in less than 3 months, companies that accept deposits of greater than HK$100 000 for periods of greater than 3 months are regulated as deposit taking companies rather than as banks in Hong Kong. ^ e.g. Tyree's Banking Law in New Zealand, A L Tyree, LexisNexis 2003, p. 70. ^ Bank of England statistics and the book "Where does money come from? ", p. 47, by the New Economics Foundation. ^ "How Do Banks Make Money?". ^ "How Banks Make Money". The Street. Retrieved 2011-09-08. ^ Pejic, Igor (2019-03-28). Blockchain Babel: The Crypto-craze and the Challenge to Business (1st ed.). Kogan Page. ISBN 9780749484163. ^ Raviv, Alon (13 August 2014). "Bank Stability and Market Discipline: Debt-for-Equity Swap versus Subordinated Notes" (PDF). EconPapers. The Hebrew University Business School. p. 59. Retrieved 13 July 2018. ^ Flannery, Mark J. (November 2002). "No Pain, No Gain? Effecting Market Discipline via "Reverse Convertible Debentures"" (PDF). University of Florida. p. 31. Retrieved 13 July 2018. ^ Basel Committee on Banking Supervision (30 November 1999). "Principles for the Management of Credit Risk" (PDF). Bank for International Settlements. p. 1. Retrieved 28 January 2016. Credit risk is most simply defined as the potential that a bank borrower or counterparty will fail to meet its obligations in accordance with agreed terms. ^ Bolt, Wilko; Haan, Leo de; Hoeberichts, Marco; Oordt, Maarten van; Swank, Job (September 2012). "Bank Profitability during Recessions". Journal of Banking & Finance. 36 (9): 2552–64. doi:10.1016/j.jbankfin.2012.05.011. ^ "Personal Data And The Next Subprime Crisis". ^ "FDIC: HSOB Commercial Banks". www5.fdic.gov. Retrieved 2016-09-04. ^ "M&A by Industries - Institute for Mergers, Acquisitions and Alliances (IMAA)". Institute for Mergers, Acquisitions and Alliances (IMAA). Retrieved 2018-02-28. ^ TNAU. "Land Development Bank". TNAU Agritech Portal. Retrieved 8 January 2014. ^ Scott Besley and Eugene F. Brigham, Principles of Finance, 4th ed. (Mason, OH: South-Western Cengage Learning, 2009), 125. This popular university textbook explains: "Generally speaking, U.S. financial institutions have been much more heavily regulated and faced greater limitations ... than have their foreign counterparts." ^ Irrera, Anna. "Banks scramble to fix old systems as IT 'cowboys' ride into sunset". U.S. Retrieved 2018-11-02. ^ a b Mishler, Lon; Cole, Robert E. (1995). Consumer and business credit management. Homewood: Irwin. pp. 128–29. ISBN 978-0-256-13948-8. ^ Statistics Department (2001). "Source Data for Monetary and Financial Statistics". Monetary and Financial Statistics: Compilation Guide. Washington D.C.: International Monetary Fund. p. 24. ISBN 978-1-58906-584-0. Retrieved 2009-03-14. ^ Lipton, Eric; Martin, Andrew (July 3, 2009). "For Banks, Wads of Cash and Loads of Trouble". The New York Times. Macon, Ga: The New York Times Company. Retrieved 13 July 2018. ^ Berger, Allen N; Dai, Qinglei; Ongena, Steven; Smith, David C (1 March 2003). "To what extent will the banking industry be globalized? A study of bank nationality and reach in 20 European nations". Journal of Banking & Finance. 27 (3): 383–415. doi:10.1016/S0378-4266(02)00386-2. Retrieved 28 January 2016 – via Google Scholar. A Guide to the National Banking System (PDF). Office of the Comptroller of the Currency (OCC), Washington, D.C. Provides an overview of the national banking system of the US, its regulation, and the OCC.